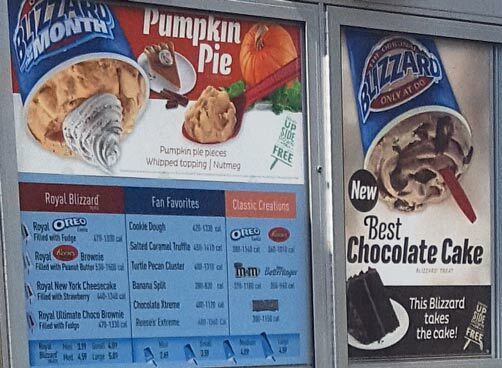 [Sept 2017] The new September 2017 blizzard of the month is here along side the returning pumpkin blizzard and now it's time to dig in. So I want to point out two things about this blizzard. The first is the rather large cake pieces. We've had a lot of fairly dense brownie bits and such from DQ, but this is the first big spongy thing we've had in awhile. If I had to equate it to something, it reminds me of the kind of chocolate cake you would find in a hostess product. Now I said that last statement with my second point in mind. The fudge frosting is quite potent. I didn't get the full effect of it until I stirred my blizzard together, but once I did, whoa, it was impossible to ignore. It made the blizzard very reminiscent of a chocolate covered snack cake you find at a convenience store. I won't say which one in particular because what you relate it to depends on your past experience, but you get the idea of what I mean. So, did I enjoy this blizzard? Ummm, yes? 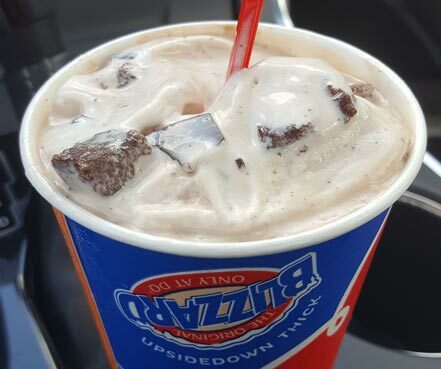 This blizzard would easily benefit from a side of DQ Grill 'n Chill french fries to help cut the impact of the frosting. It's not that it's the only flavor you will taste, it's just that it's a piercing flavor. You can't get it out of your mind once it invades your tastebuds. On one hand it made this blizzard unique, but on the other hand I couldn't help but debate if it was too much for me. So there is both a review and a potential warning. If you are still interested, go for it! If you'd rather hold back, that's cool too. As with all DQ reviews, your mileage will vary. Why didn't they use chocolate ice cream instead? It would have been amazing. A vanilla blizzard with chocolate cake and frosting? I'm intrigued. Now I have something to do on the next day off. Speaking of cake, when you see it could you review the Blue Bunny Vanilla Bean Blondie Ice Cream Cake? I normally don't care for Blue Bunny's "poor man's ice cream" (read : Cool Whip) texture but as someone searching for blondie flavors that don't involve maple or salted caramel, I'm curious. To my knowledge, it isn't Walmart exclusive, but Walmart is the only place I saw it. @Anon: distribution varies by area and since I'm pretty far from Iowa, I don't get a ton of BB choices near me. Before I could only find them at walmart with a semi decent selection. Now I can find them in more stores, but they all have the same few flavors available. It's disappointing. @Anon:if you're looking for "non poor man's ice cream," have you tried b&j's blondie ambition? It's kind of mellow/mild, but I think it's really tasty. Though it's a target exclusive, which is a little annoying. This website indicates that, that flavor is 2-4 years old. My nearest Target already stopped carrying "Keep Caramel and Cookie On" (or they never carried it to begin with) and that was this year! It wouldn't hurt for me to ask I guess. Dubba, I don't live near Iowa either, if that helps (I'm in Virginia). Iowa is Blue Bunny's HQ? @Anon: Blondie Ambition is still very much a thing as Target has kept four exclusive flavors on hand for several years now. The new KCCO is just super hard to find, me thinks that they need to boost production by a lot. Yup, Wells (Blue Bunny) is based in Le Mars, Iowa. It took a while for my Target to get KCCO, but now they're stocking it regularly. If you look for either flavor, good luck! Lately I've been just hitting Yogurtland or a Yogurt store with available mix-ins. Vanilla yogurt (or ice cream from Yogurtland) with as much Reeses as I can possibly fit in the cup, plus almonds, kit kats, snickers..its a dream come true. So I finally tried this thing and I gotta say I disagree with the Hostess comparison. Hostess has better cake than what they used. The chunks were SO dry and flavorless. I never had their Red Velvet Cake blizzard because I CANNOT with cream cheese, but based on your review of that and how it looked in pictures, it looked like moister cake, with a lot of crumbs. The cake component of this blizzard should've been like that. I will however give them props for the frosting mixed in the base. It tasted just like Duncan Hines chocolate frosting to me...Not generic fudge sauce, but FROSTING. You were right about it being very intense though. I ordered a small and only ate 70% of it before throwing it away. I was beginning to FEEL the diabetes encroaching upon me. My stupid fault for not ordering a kid's size, which is what I'll do before the month is out. That's classic DQ! fresh cake at location A, dried out cake at location B. So annoying.